Although there's no fountain of youth for cut flowers, you can boost their longevity with these uncomplicated, time-tested tips. It’s amazing to witness, time and time again, how much brightness and cheer a simple vase of flowers can introduce to a room. Unfortunately, like other forms of beauty, bouquets are a fleeting treat, and it’s only a matter of days before they wilt away and die. Though you cannot prevent the inevitable, there are a few ways to forestall it. First, check to see whether the florist included a packet of flower food with your purchase. Believe it or not, that stuff actually works. If there’s no flower food available—if, for instance, you cut the flowers in your own garden—try one of these time-tested tricks to keep cut flowers fresh just a little bit longer. Since bacteria and fungi accelerate the natural deterioration of cut flowers, it’s imperative to wash—thoroughly wash—whatever vessel you’re planning to display your blooms in. When cleaning the container, use hot and soapy water. Or, if you like, disinfect the vessel with a solution of diluted household bleach (one part bleach for every 10 parts water). Finish up by rinsing with plain water. Clipping flowers from your garden? Try to do so early in the morning, before the heat of day saps any vigor from the blooms. Along with your pruner, remember to bring a bucket of tepid water. 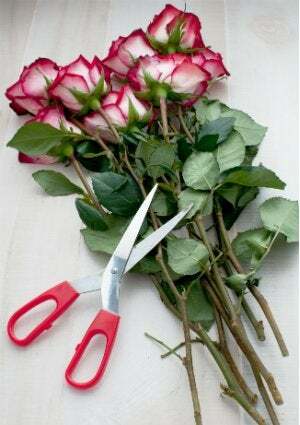 As you cut each flower, place it into the bath so as to prevent the end of the stem from drying out and sealing off. If working with store-bought flowers, remove about one inch from the bottom of each stem. Make your cut at angle, under a running tap. Shortening the stem encourages the flower to take up water again Before setting your bouquet into its container, remove the lower leaves to minimize decay. 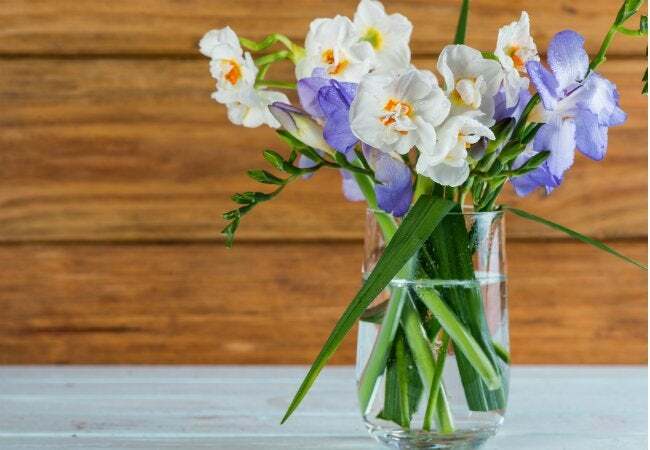 Rather than simply filling your chosen container with water, many recommend keeping cut flowers suspended in a solution comprised of one part lemon-lime soda, three parts water, and, for every quart of liquid, a quarter-teaspoon of household bleach. Don’t use diet soda; the full-calorie sugar provides valuable nourishment to the flowers. Meanwhile, the bleach keeps harmful bacteria at bay. Having taken all the right steps toward keeping your cut flowers flesh, go ahead and set them out on a surface in your home. Be aware, however, that not all surfaces are equally conducive to flower longevity. Avoid putting blooms in direct sunlight, near heating vents, or next to heat-generating appliances.